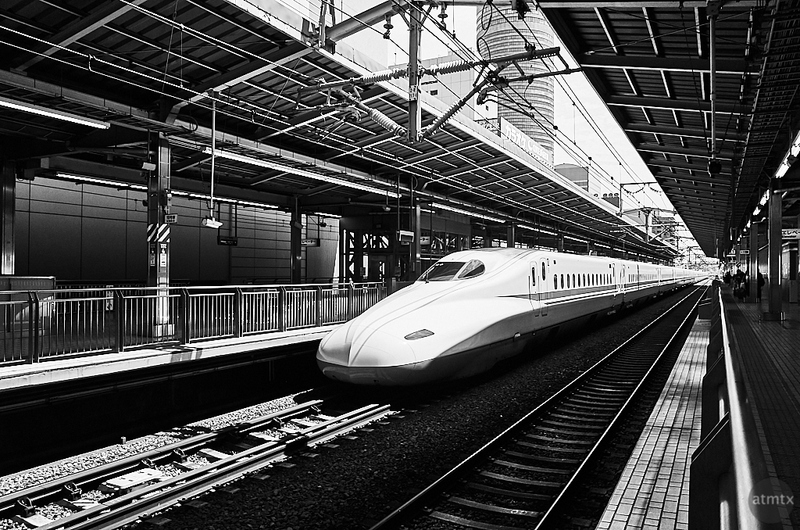 The Shinkansen, known as the bullet train in the U.S., is a remarkable transportation system. It’s been in service for 52 years and there’s never been a fatality on the train due to an accident. It started service just before the start of the 1964 Tokyo Olympics. Since then, newer, ever faster trains with increasingly sleek designs have continuously been put into service. There are may different models throughout the system. This one is the Nozomi N700 series, which I took from Shin-Yokohama Station to Kyoto Station. The distance is roughly 275 miles and it took 2 hours with one stop in between. They have a maximum speed of 186 mph. Like most trains in Japan, the Shinkansen is exactly on time. It’s the closest thing we have to a Star Trek like transporter. Unlike the faster but more cumbersome plane, you go from city center to city center. There’s no security checks and because of the precise timing, you can board within a minute of departure. They are also remarkably long, some with 16 cars, which make for photos with awesome leading lines. The Shinkansen is one of my favorite things about Japan. It’s such a civilized way to travel. Marvelous photo! From composition to the B&W tones — should be a textbook example of how to do it right. Thank you, Mike. The sun shining on the white train was a bit harsh. Luckily a little RAW processing and the contrasty black and white worked to my advantage.